Home » A Review of the Low-Cost Cuisinart DBM-8 Supreme Automatic Grinder: Is It Too Good to Be True? A Review of the Low-Cost Cuisinart DBM-8 Supreme Automatic Grinder: Is It Too Good to Be True? The Cuisinart DBM-8 Supreme Automatic Burr Mill Coffee Grinderis praised highly online for being the affordable, attractive, and most importantly powerful electric burr grinder for home brewers and coffee lovers. I was surprised at the $39.89 price tag, roughly a quarter of the cost of most at-home grinders, so naturally, my first thought was: is this too good to be true? Well, let’s find out together. In this Cuisinart DBM-8 Supreme Automatic Burr Mill Coffee Grinder review, which I will now just refer to as the Cuisinart Supreme for time and sanity’s sake, to find out if it lives up to the hype. 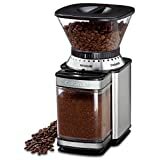 This Cuisinart DBM-8 review is based on both the opinion of the expert coffee drinkers who examine coffee gear for a living (otherwise known as my dream job) and from verified purchasers I like to call my “coffee brigade.” These are authentic coffee lovers, that enjoy all the coffee little things, and write online reviews to share their experiences to help others discover, enjoy, and sometimes avoid, coffee gear on e-commerce websites helping you to get the perfect cup of coffee. What’s an Automatic Burr Mill? What Does the Coffee Brigade Think? 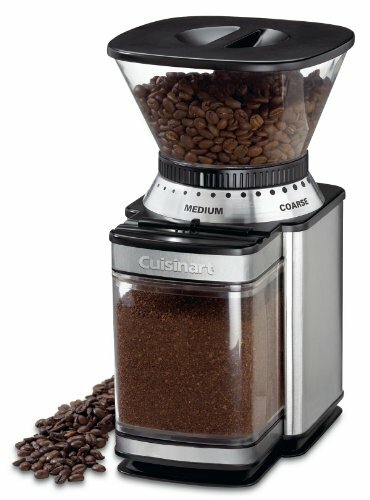 So, What Do You Think About the Cuisinart DBM-8 Supreme Grind Automatic Burr Mill? Includes: Ground chamber with lid, removable 8-ounce bean hopper, combined coffee scoop and cleaning brush tool. Settings: 18-position grind selector from ultrafine to coarse. It’s both: a burr mill is a grinder comprised of stainless steel grinding disks that are either a conical burr (cone-shaped) or flat like the disks in the Cuisinart DBM-8 Supreme. Small hard particles pass through these plates to create freshly coffee grinds based on the coarseness predetermined by the user. For example, if I wanted a coarser grind for a pour-over method of brewing, the plates would be further apart. Conversely, if I needed grinds for an espresso coffee, I would choose an ultra fine setting placing the plates close to one another to produce that powder-like texture. Chances are since you are reading this, you know your grind and are eager to learn how this machine works to get a great cup of coffee. The good news is: this electric grinder is simple to operate, and its chambers hold enough beans and ground coffee so it’s not a chore each time you use it. Load the coffee beans into the hopper that can hold up to 8 oz. of beans. Slide the bar to set how many coffee cups you want to brew (between 4-18 cups). Rotate the bean hopper to select your preferred texture. There are 18 available options for this setting, six for each ground type of ultra fine, fine, and coarse. Press start and automatically the electric grinder will deliver the amount of coffee specified. Now it’s time to step away from the manufacturer’s website and its strategic marketing messages and ask an actual user what they think. It’s important to note that members of the coffee brigade are verified purchasers, both industry experts, and customers, that offer unbiased opinions based on their experience. After scouring the reviews on e-commerce sites like Amazon and reading thoughtful reviews from people whose job it is to review such things, I think it’s best you hear straight from these purchasers. I’ll give you the snapshot I would want to see as a buyer: the good and the bad, also known as the pros and cons, with some evidence to back it up taken directly from their reviews. To keep it fair and consumer-focused, I’ll only include snippets of reviews from verified purchasers on Amazon as my e-commerce reference. One of the reasons I’m excited to write this review is because of its cost. Like I mentioned before, low cost and high reviews? There must be a catch; it seems too good to be true! A quick search online will show you the price can vary on this machine, with Amazon offering the lowest price at $39.89 (plus shipping unless you’re an Amazon Prime Member). Any experienced brewer will tell you the more expensive the grinder, the better than grind. This electric grinder may prove to be the anomaly. In general, this grinder receives mostly positive reviews, averaging a 3.9/5-star rating. When it comes to price, many first-time grinders were ready to take a chance on this machine rather than pay hundreds more for the sophisticated alternatives. There is no denying this grinder is affordable when compared to others that perform the same function yet are sometimes outrageously more expensive. If you are new to homebrewing and want a standard grind, this is the affordable way to go. The Cuisinart Supreme Grind Automatic Burr Mill is easy to use and if you don’t believe me, hear it for yourself in the video below (spoiler alert: it’s the same video like the one above, I’m just trying to make it easy for those who don’t like to scroll). It really can’t get any simpler than that! You pour beans in a hopper, select a grind and cup size, and push a button, and fresh beans are transformed into grinds in seconds. You don’t even have to stand there while it works! I love that you don’t have to think about what you’re doing when you grind. I’m not kidding! Instead of staring at a clock or trying to gauge with your senses if it is ready, the machine handles all of that for you. You also don’t have to second-guess whether you have enough grinds for the amount you want to brew since you already selected your cup size. That’s a win-win in my book! Especially since I’m only half-awake when I’m grinding my beans in the morning as it is in my kitchen. For those that like variety, this is the grinder for you. 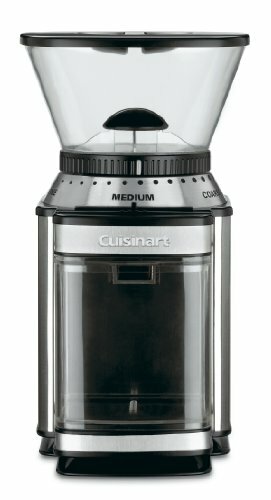 Reviewers claim the Cuisinart Supreme performs well for brewers that want a standard or medium grind for automatic and pour-over brewing methods. Reviewers love the fact that there are so many grinding options; three main settings of fine, medium, and coarse and within each setting, six choices for a total of 18 grind settings. The variety of settings offered by this grinder makes it the perfect choice for those that want to customize their coffee experience wich any coffee lover will appreciate. Reviewers are pleased with the shelf-life of this grinder, many saying they hoped for a couple good years and were pleased it still worked well more than three years later! They appreciate its durability and like it enough to buy it again. Some people claim the Cuisinart Supreme produces an inconsistent texture on both its ultra-fine and coarse settings. Keep in mind that the Cuisinart Supreme is almost a quarter of the cost of a standard electric burr grinder that averages around $200, so expectations should rightly be adjusted accordingly. One reviewer said that while this grinder is ideal for new grinders who use drip brewers or French press methods, it may disappoint more experienced coffee drinkers who expect ultra fine to give them a more refined powder-like texture for more sophisticated caffeinated concoctions. If you are a skilled home coffee drinker looking to create that perfect espresso than this is not the machine for you. However, if you are just beginning to grind in our own kitchen and are using an automatic brewer or Chemex, the Cuisinart Supreme can deliver what you need. There is no sugarcoating this fact: this grinder is loud. In its defense, most grinders are loud unless you are willing to pay more money for a grinder engineered to produce less noise. Granted, it only takes seconds to grind, but those seconds may wake you up before the caffeine does. You should either watch the video above to see if it’s within your comfort zone or try one out for yourself before buying if possible. Some reviews claim the Cuisinart Supreme is difficult to clean because there is no way to take it apart and give it a thorough once-over with the cleaning brush to get rid of the coffee dust. One reviewer claims this isn’t true and may be attributed to the inadequate cleaning instructions provided by Cuisinart in the owner’s manual. If you can take the time to get to know how the machine works, cleaning it won’t be an issue. This amazing grinder will get the job done at an affordable cost. After reading hundreds of reviews both good and bad, I believe it’s worth a try. Enough said for this Cuisinart DBM-8 review. The Cuisinart DBM-8 works perfectly with my pressurized DeLonghi espresso machine. Three of its six Fine settings are very fine. What it won’t produce is the talc-fine powder needed for non-pressurized espresso machines and Turkish coffee. Its List Price is $90.00, not $38.99. The discounted price shown here is what Amazon often sells it for.